This page is dedicated to all those items I have which don't fit into any specific collection. Sometimes they're things I've bought specifically sometimes they're gifts, but they're all well loved pieces of my collection! 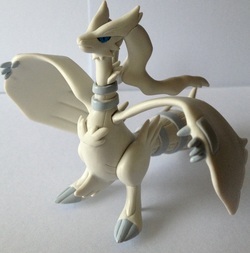 Reshiram 1/40 scale zukan figure, in all it's majestic glory. Seriously one of the most beautiful zukan ever. Kids are 2 inch tall figures, very detailed, and made of hollow plastic. 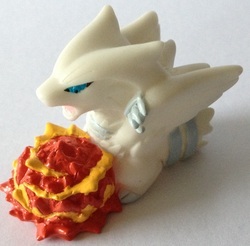 This one is Reshiram using a fire attack - not sure which though. This toy was given away by McDonalds stores in the USA with their Happy Meals. They came with a sparkly card, too. 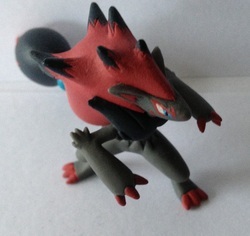 A 1/40 scale figure of Zoroark! 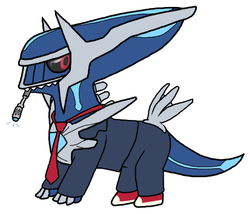 He did come with a Zorua, but I sold him separately. Kids are 2 inch tall figures, very detailed, and made of hollow plastic. 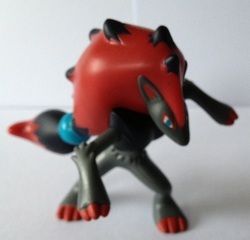 This one is slightly sparkly, and was made for the 2011 movie starring Zorua and Zoroark. 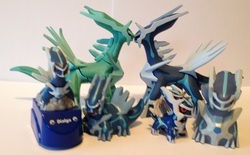 Dialga was one of my main collections, but when Keldeo came out, I had to downsize his collection. 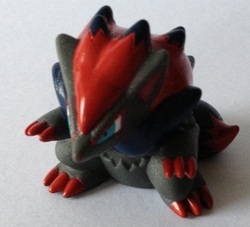 Now I have 2 zukans (one painted shiny by a good friend), a clear Kid, small charm, scooping figure and racing figure. I couldn't have Time without Space! So here's a clear Palkia and the 1/40 scale zukan figure. As with Dialga, when Keldeo came out, my Porygon collection was pared down to these items. 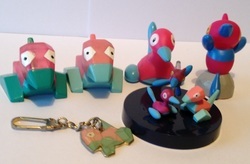 I have both normal and clear Porygon kids, Porygon2 & PorygonZ kids, the zukan and a metal swing keychain. This is my little Mewtwo collection! I love the genetic kitty, but his merch is very competitive, and I don't have the funds to bidwar over things. 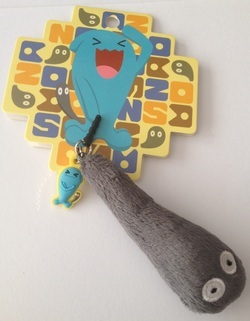 Here's the TOMY figure, flashing keychain, clear and normal kids and a little Brazilian figure. 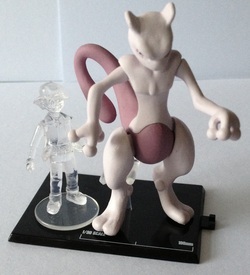 Made as one of a set of figures to commemorate the 10th anniversary of Pokémon, this 1/30 scale zukan comes with a 1/30 scale Ash figure to show the height difference between humans and Mewtwo. What pokémon collector doesn't own something with Pikachu on it?! 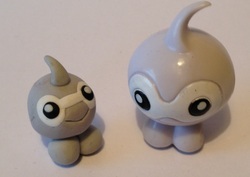 Here's the Mystery Dungeon diorama figure, a TOMY and a playset figure. Preorder figures are figures given away when you preorder one of the games. I'm still searching for 3 more; Dialga (Diamond), Palkia (Pearl) and Darkrai (Pokémon Ranger; Shadows of Almia). From left to right, I have: Chimchar, Turtwig and Piplup (Pokémon Diamond and Pearl together); Giratina (Pokémon Platinum); Arceus (HeartGold and SoulSilver togehter); Ho-oh (HeartGold) and Lugia (SoulSilver). I really love Castform, but only his natural forme - so I have a very little collection, featuring a custom mini-figure and a Candy figure. Meet Lucky! I bought this guy in January, 2013, when I was very ill with pneumonia. 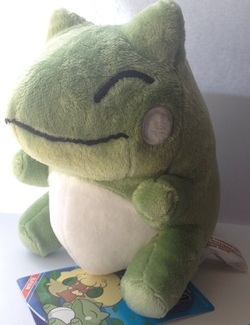 I waited, and waited, and he never showed :( Then, in April, I got a message from the seller saying he'd arrived back in Japan, and would be sent out with my next order! So he's super lucky hehe. He's about 7 inches tall, and the softest plush ever. Designed to look like the Pokédoll/Substitute sprites in the video games. Your eyes do not deceive you - there is a lawnmower on this page. 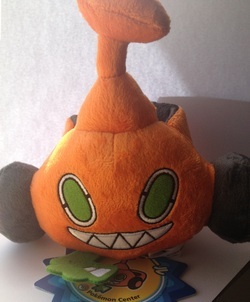 When the latest Rotom promo was announced (April 2013), I knew I wanted one of the pokédolls of the formes, but which one? I had to choose CutCut, because I had such an amazing one on my playthrough of Platinum. You can see all of them and the other goods here, on Sunyshore. This is a cell phone charm, which sits in your headphone jack of your phone. It's made of minky and is utterly adorable! 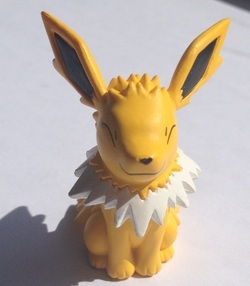 These are an incredibly well made series of figures made of the Eevee evolution line. I chose to pick up Jolteon, but the others are so tempting, too! You can see the whole collection here. I can't describe this thing. 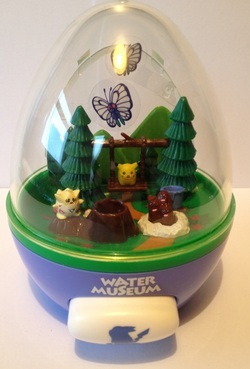 You fill it with water, and it's like... A snowglobe of pokémon joyfulness. And there's another one, which I am desperately scouring the world for. This is my everyone else pile! Regice legendary figure (because my first legendary on GPX+ was a Regice); Bulbasaur VTrainer figure; TOMY Clefairy doll; and Blue Shellos Kid.